1. 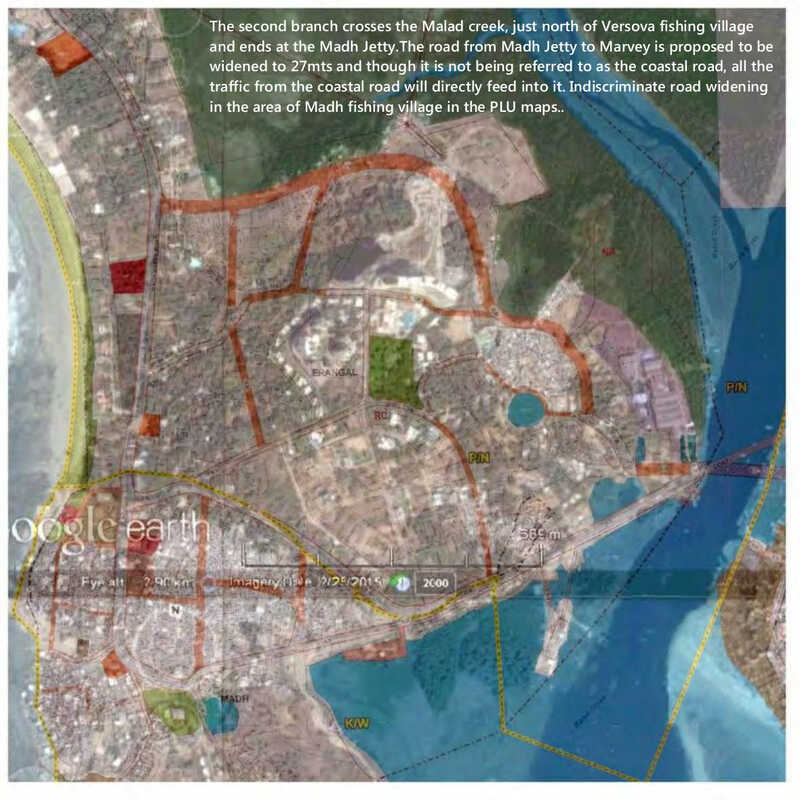 All natural areas like, Mangroves, Mud flats, Salt pans, hills and forest lands should be zoned as natural areas and no construction or infrastructure activities should be permitted on these lands. 2 Special regulations (DCR) for the protection of natural assets and ecological features such as beaches, water bodies, hills, forests need to be incorporated in the DP specifying the nature of activities and type of development permissible in these areas. 3. All Water bodies such as ponds, creeks, streams, Lakes, River, Nalas, bays and estuaries should be demarcated as natural areas in the development plan. Existing open spaces on the sides of water body must strictly be reserved as public open spaces. 4. All existing Natural areas which were demarcated as no development Zones in the development Plan of 1991 should be protected and designated as natural areas in the proposed land use plan. 5. 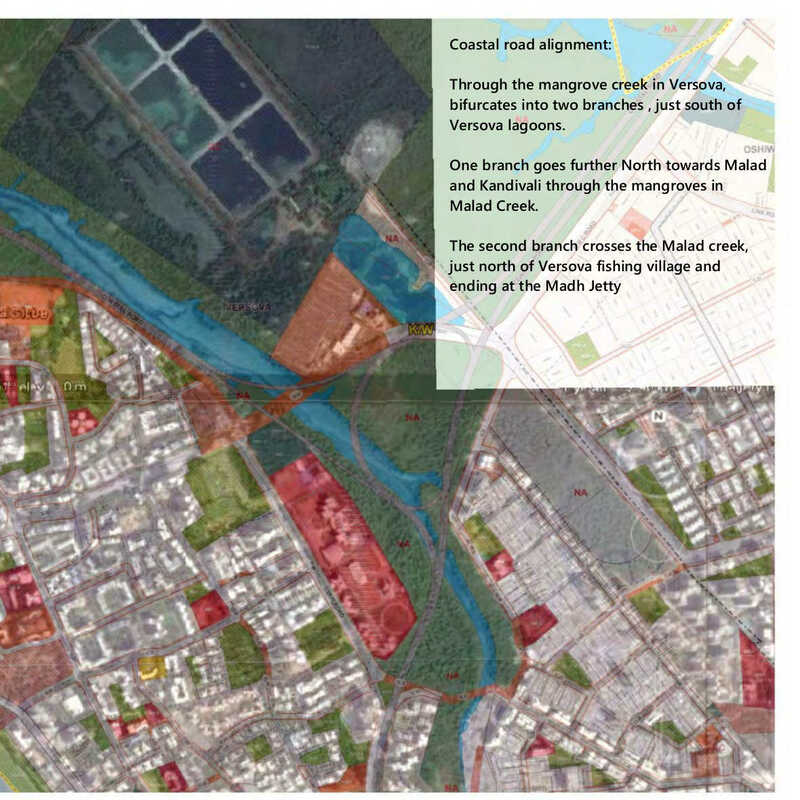 The draft Development Plan 2034 looks at Aarey Milk Colony Lands as an opportunity for creating large scale public infrastructure for the city, with proposed institutions and other uses. 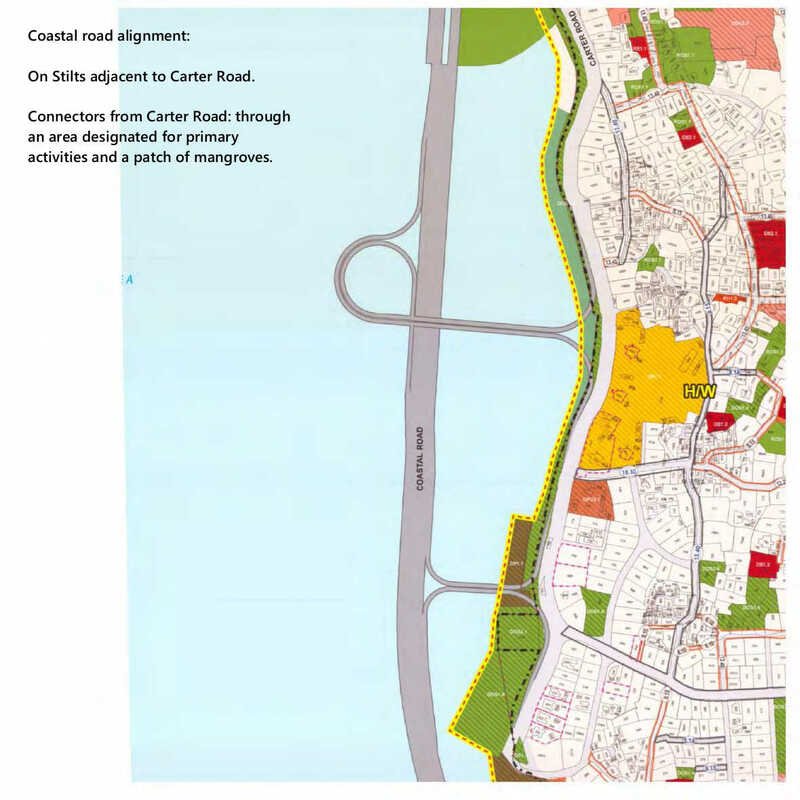 A large part of Aarey has been reserved as an open space in the PLU map and uses such as themeparks, recreational grounds, sports grounds and a zoo have been proposed here. 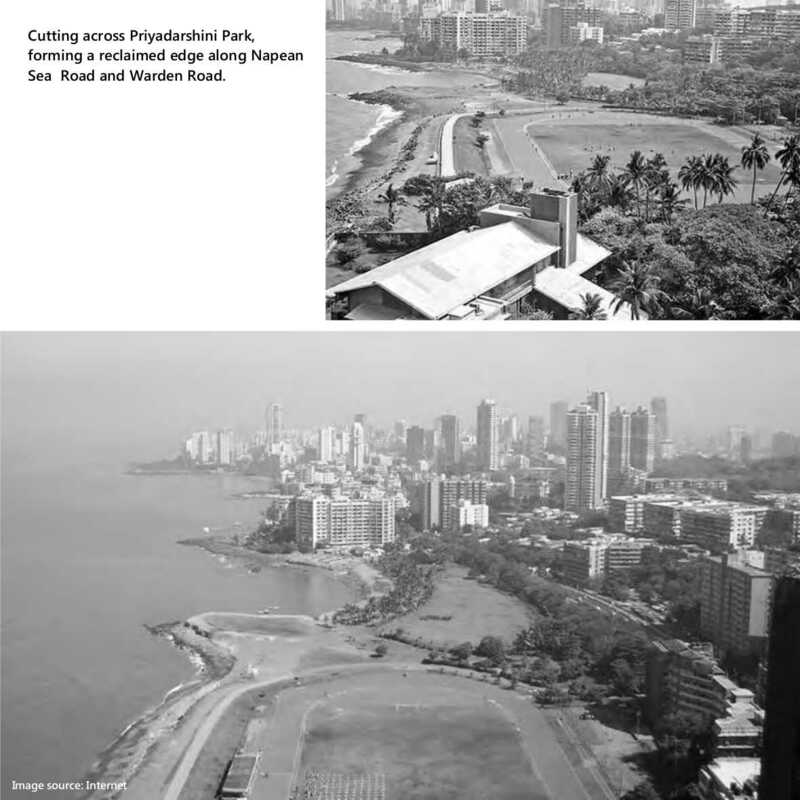 We object to these proposed landuses and suggest that all natural areas and open spaces within aarey, which include hillocks, forests, plantations, groves, grassy meadows and farms should be retained and protected. 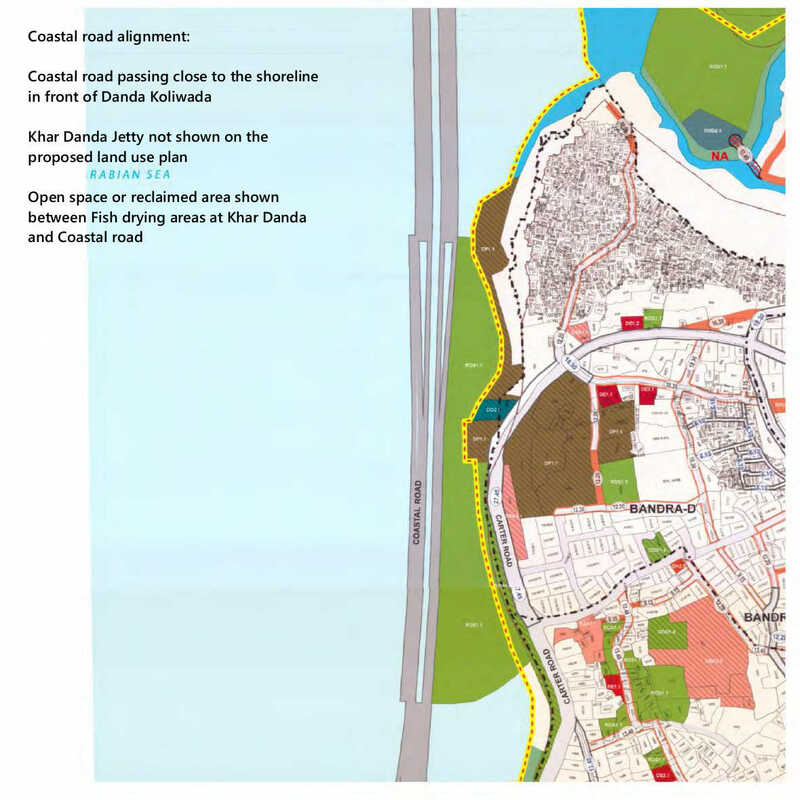 The entire area of Aarey should be demarcated as a natural area in the PLU maps and only certain uses such as adivasipadas or primary activities should be permitted here. No large scale construction or infrastructure should be permitted on these lands. 6. 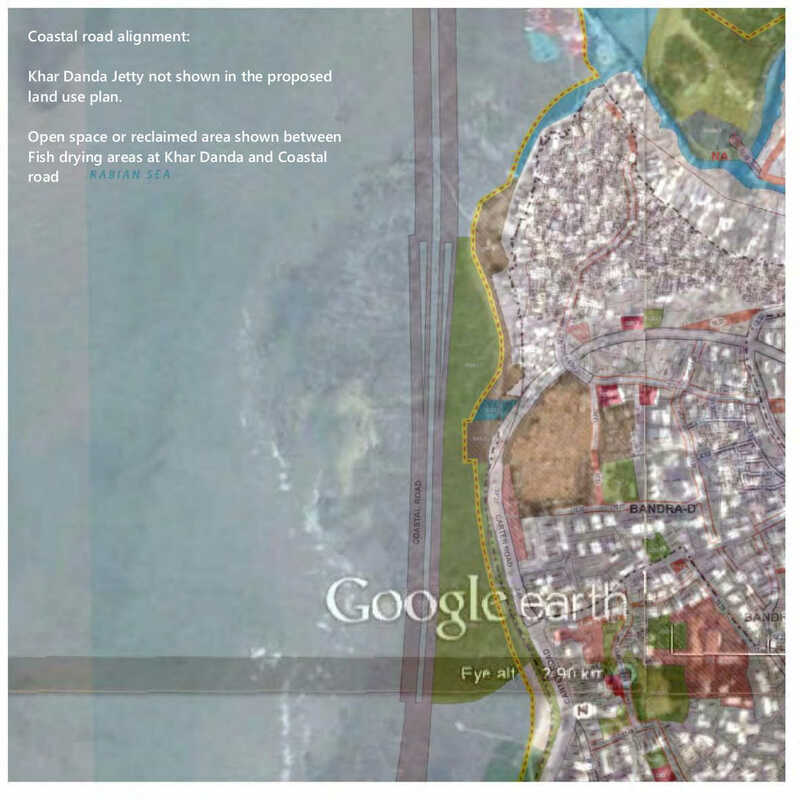 The New Coastal Zone Management Plan for the city of Mumbai which is to be made in accordance with the Coastal Zone Regulation Notification of 2011 is yet to be finalized. 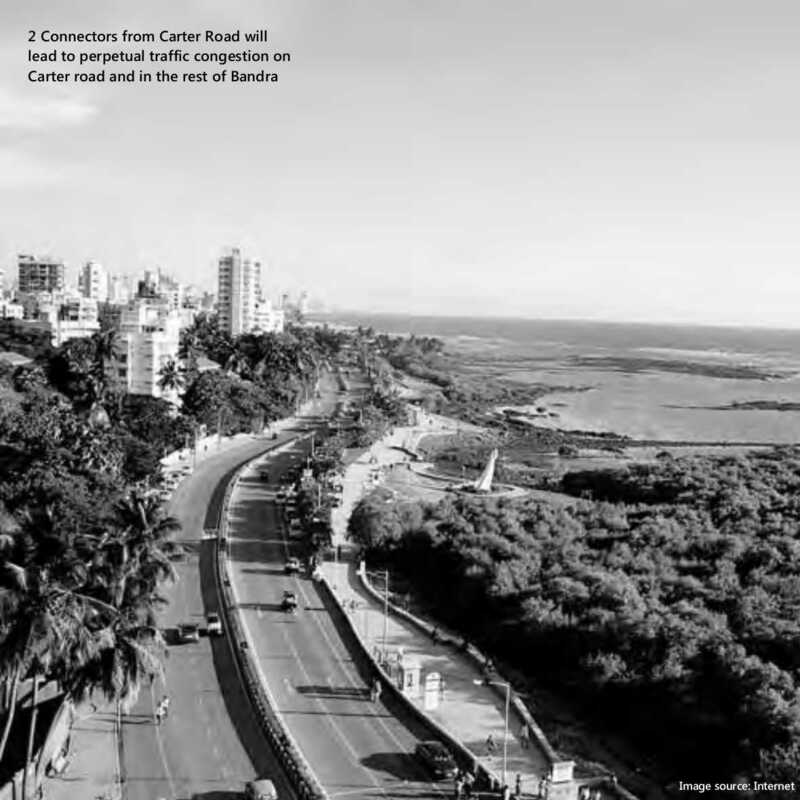 We object to the fact that the Development Plan of a coastal city like Mumbai is being finalized without there being an approved and final CZMP in place. 7. 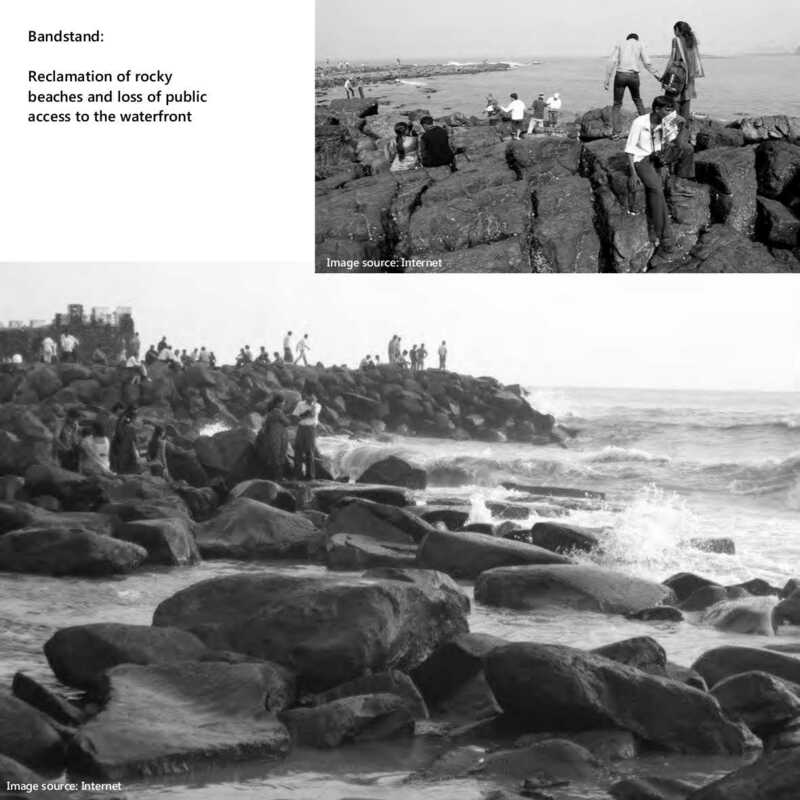 Mumbai’s Coastline consists of various natural features such as rocky headlands, sandy bays and estuaries which support diverse ecological habitats. The natural diversity of the coastline should be maintained by protecting these as natural features. All beaches should be demarcated as a landuse category under natural areas and not under open spaces as has been presently done. 8. 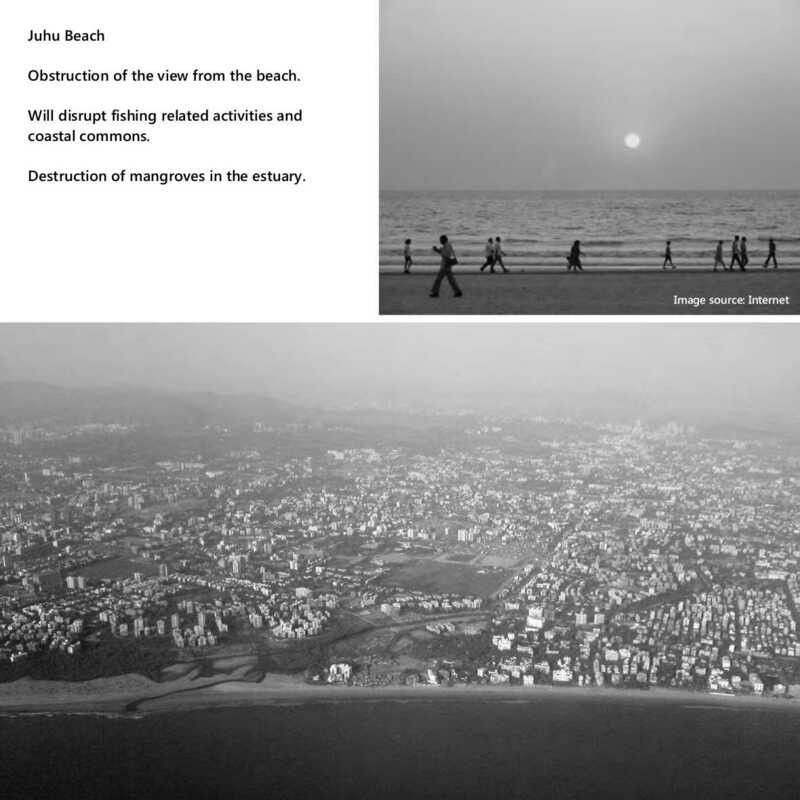 Beaches are natural features of the coast and should not be reclaimed for construction of roads and open space or subjected to intensive beautification and construction activity. 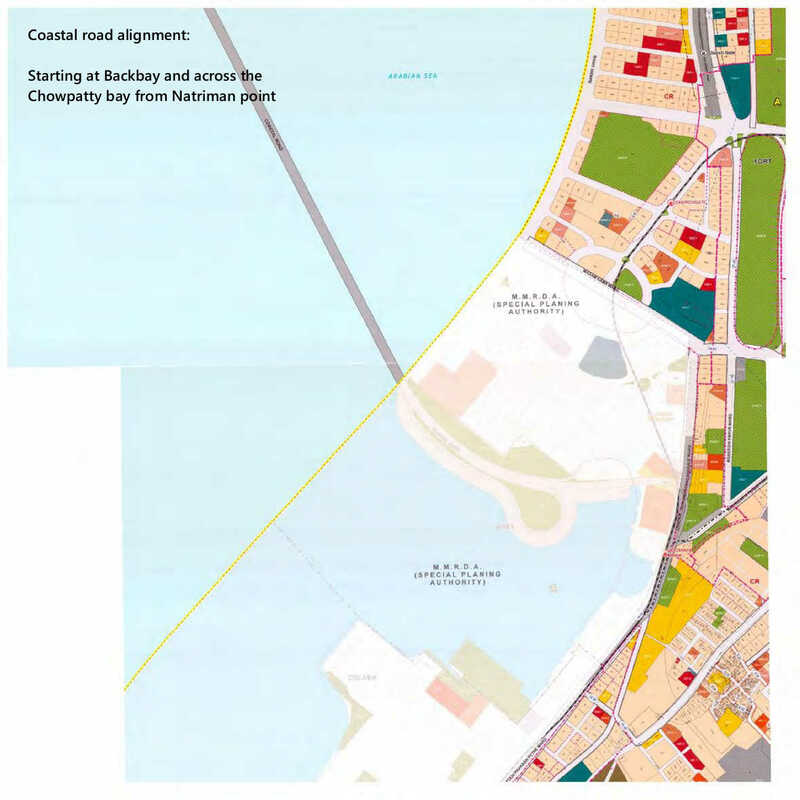 No new roads should be proposed on rocky and sandy beaches. No construction activity including landscaping or the construction of promenades should be permitted on beaches or in other natural areas. 9. 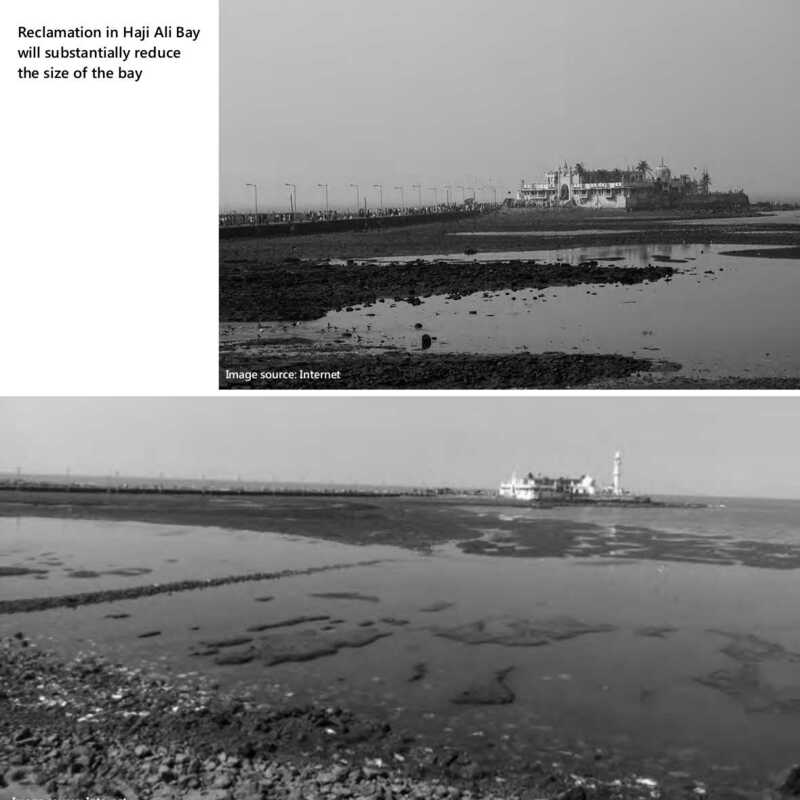 Reclamation in mangroves, estuaries and the sea should not be permitted. Dumping of rocks, tetra-pods and construction of concrete walls and land filling in rivers, creeks, lakes, ponds, nullah’s and seas should be strictly prohibited. 10. 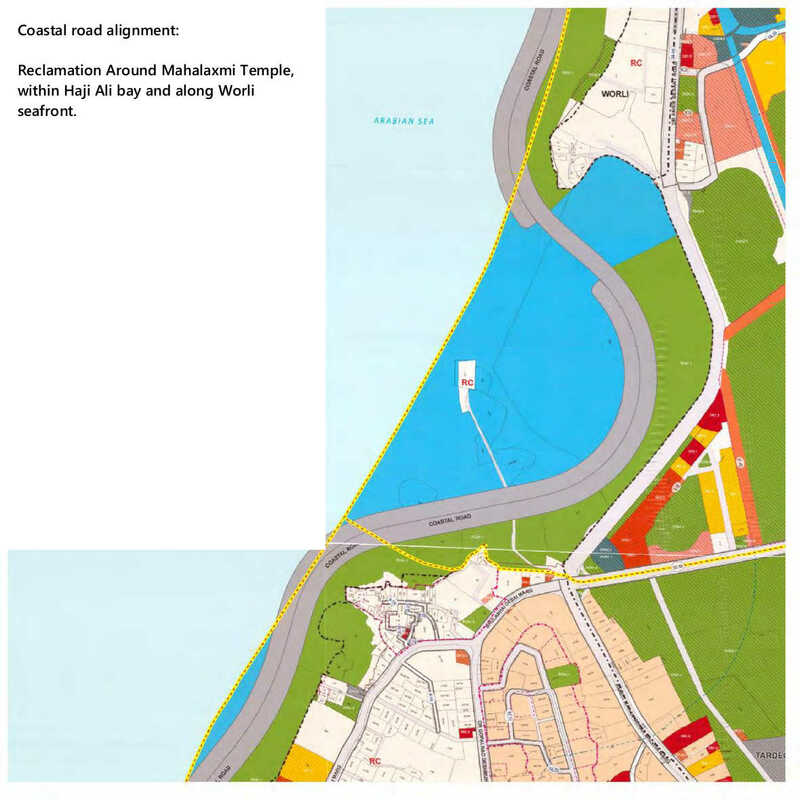 The Coastal Road which connects Nariman point to Kandivli in the suburbs and has been shown on the PLU maps will have severe ecological and social impacts and will be disastrous livelihoods of coastal communities. 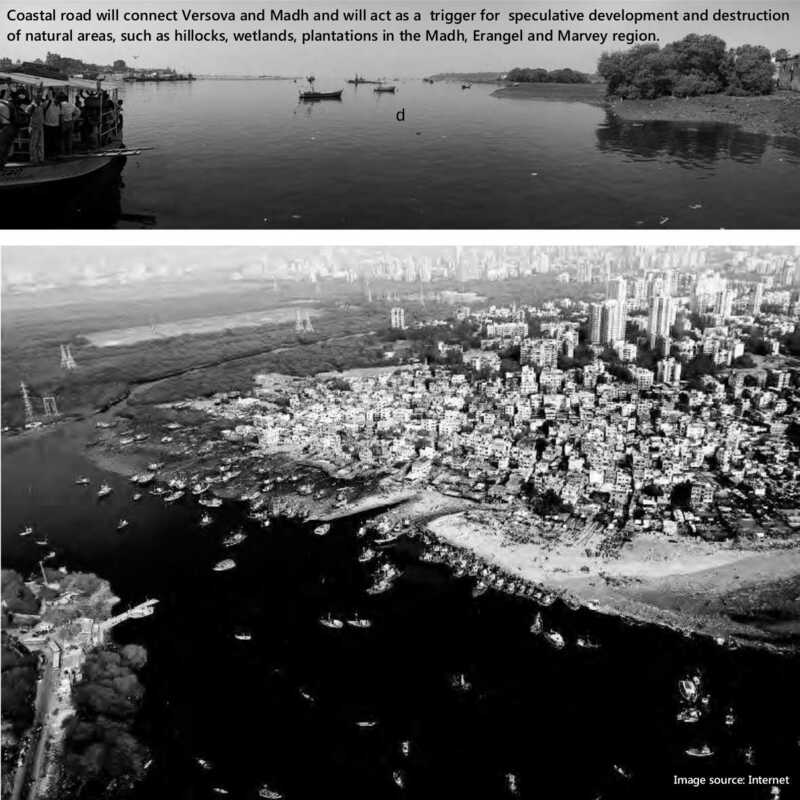 This project threatens to in large stretches cut off the city from the sea, erase and obliterate natural features, destroy coastal ecology, cut off historic sites from the sea, reduce the size of bays, result in the loss of diversity and public access to Mumbai’s waterfront. 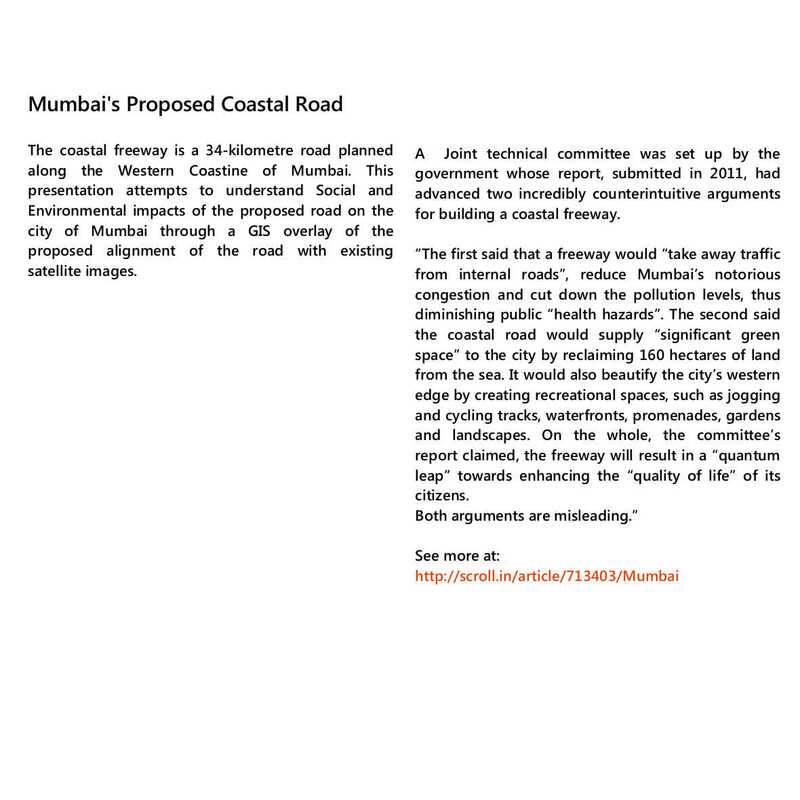 We strongly object to this project as it threatens destroy what is left of Mumbai’s ecology. 11. 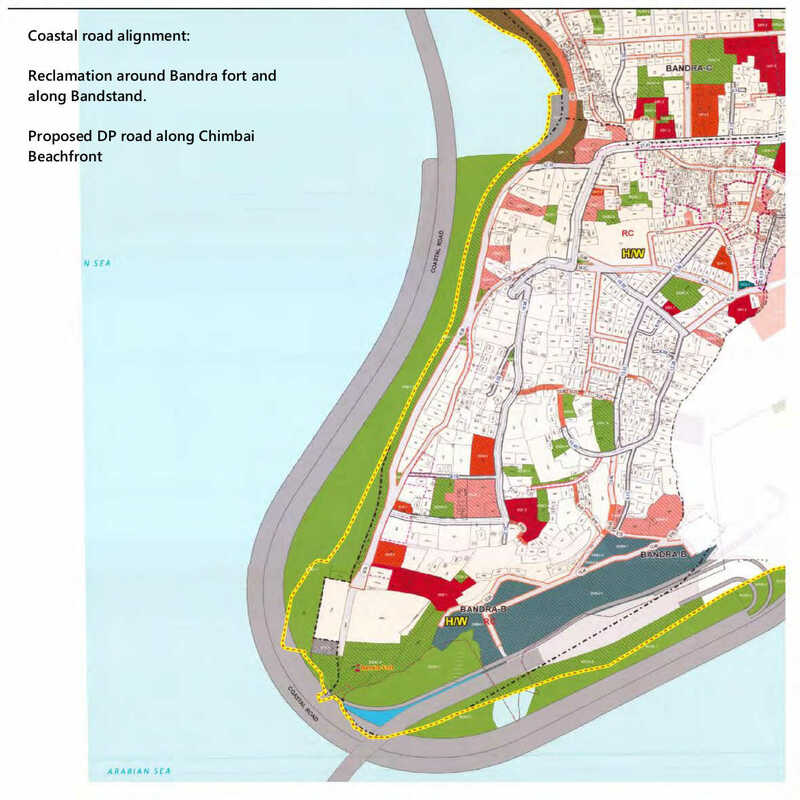 Reclamation of beaches and in the sea has been proposed for the construction of the coastal road. These reclaimed areas have been demarcated on PLU maps as open spaces. 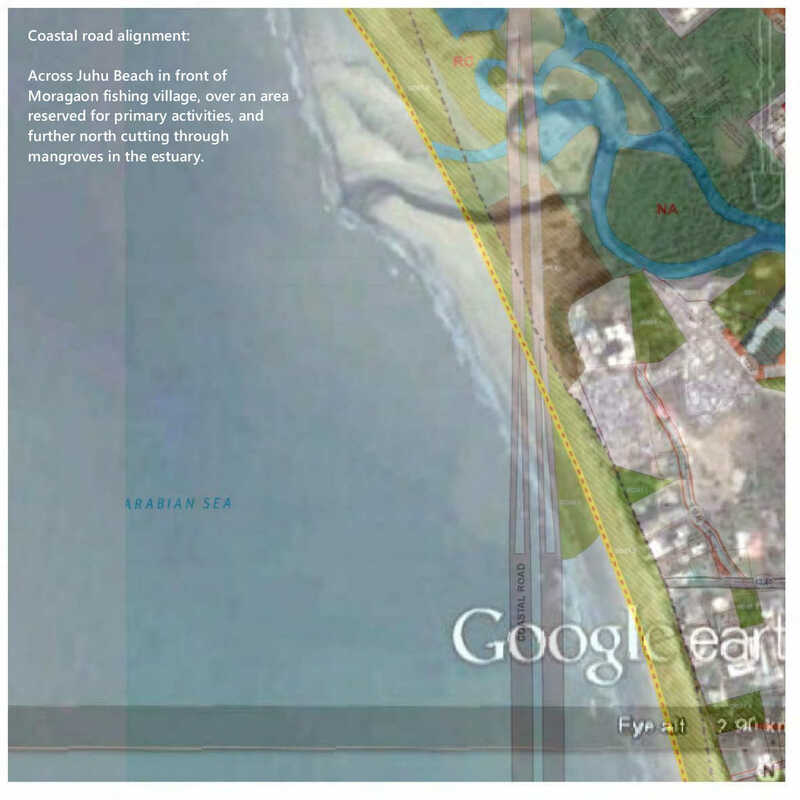 There should be no open space reservations in areas in areas below the high tide level, or along rocky and sandy beaches. 12. 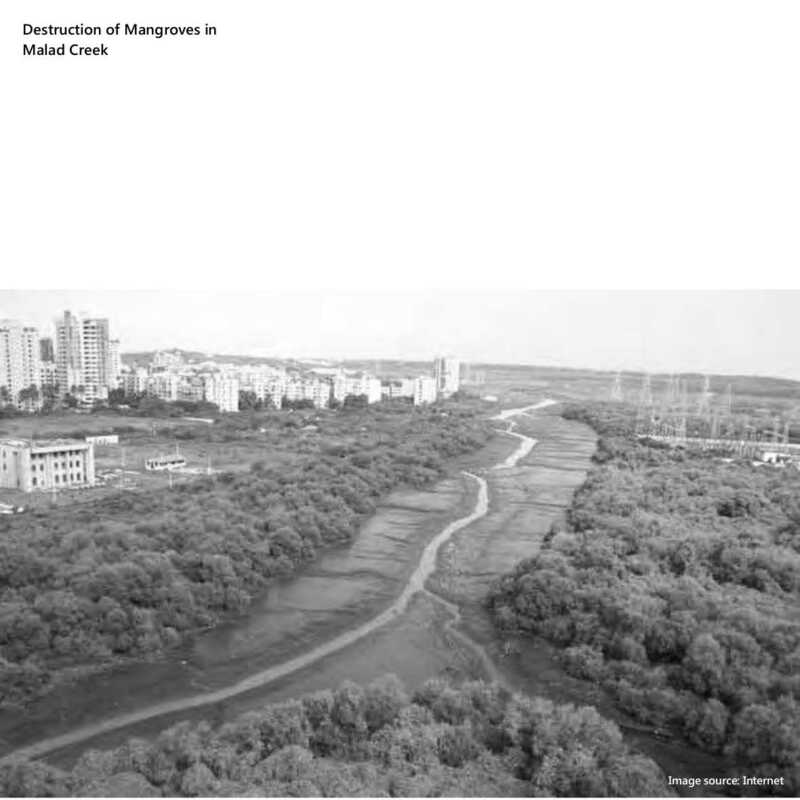 All existing mangrove areas are designated as CRZ I should be protected. 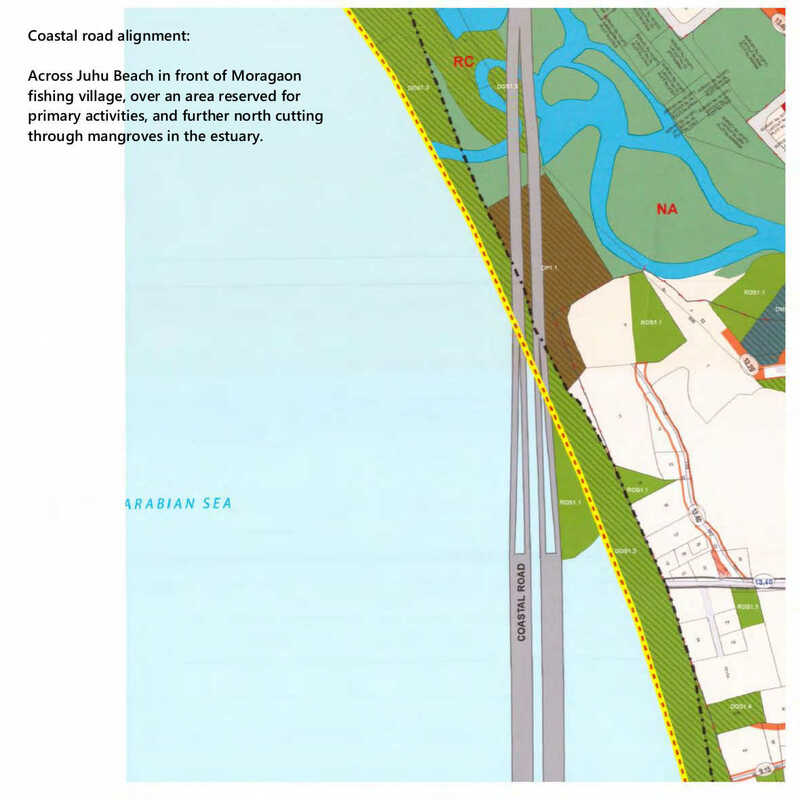 No construction activity within mangroves, including the construction of stilt roads should be permitted. Mitigation measures such as Compensatory afforestation cannot compensate for the destruction of these existing natural habitats. 13. 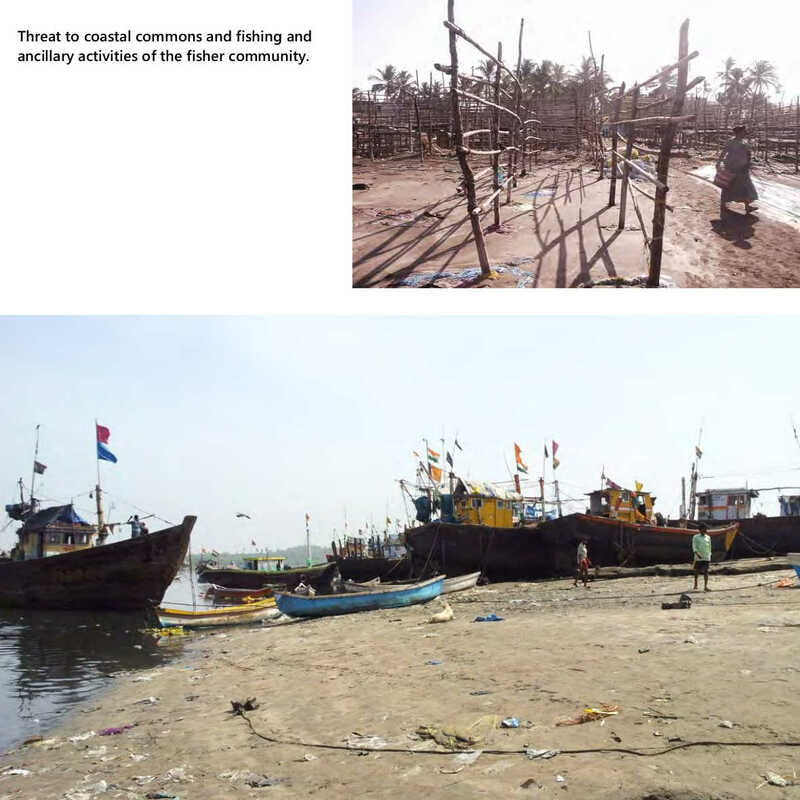 Reclamation on the seaward side of fishing villages or areas having primary activities which will cut off access from the sea is a threat to the coastal commons and ancillary activities of the fishing community. 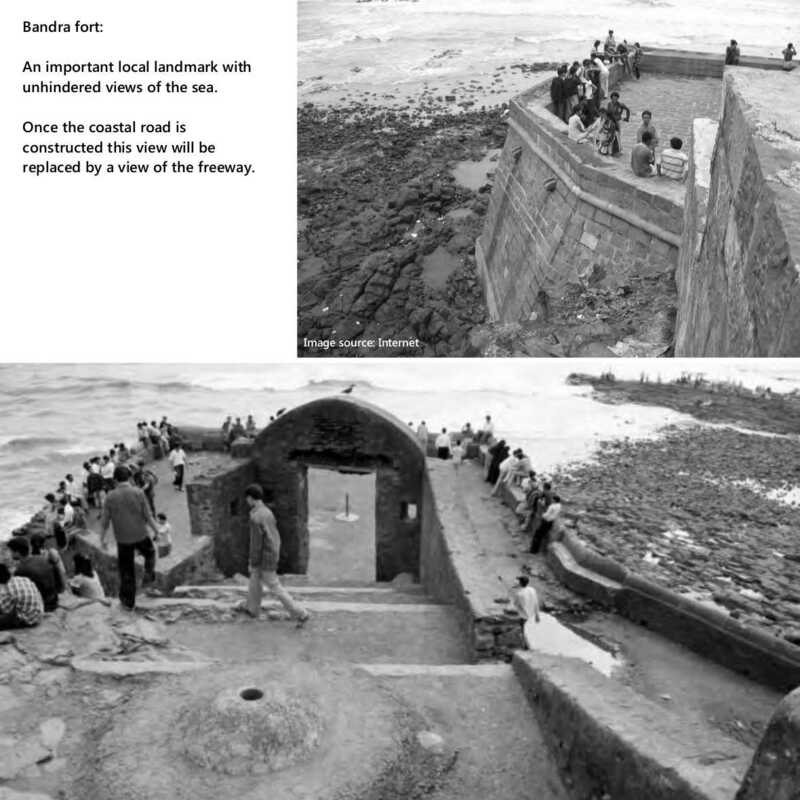 The natural shoreline and slope of the beach especially on the seaward side of fishing villages which is often used for the parking or docking of boats should be maintained. 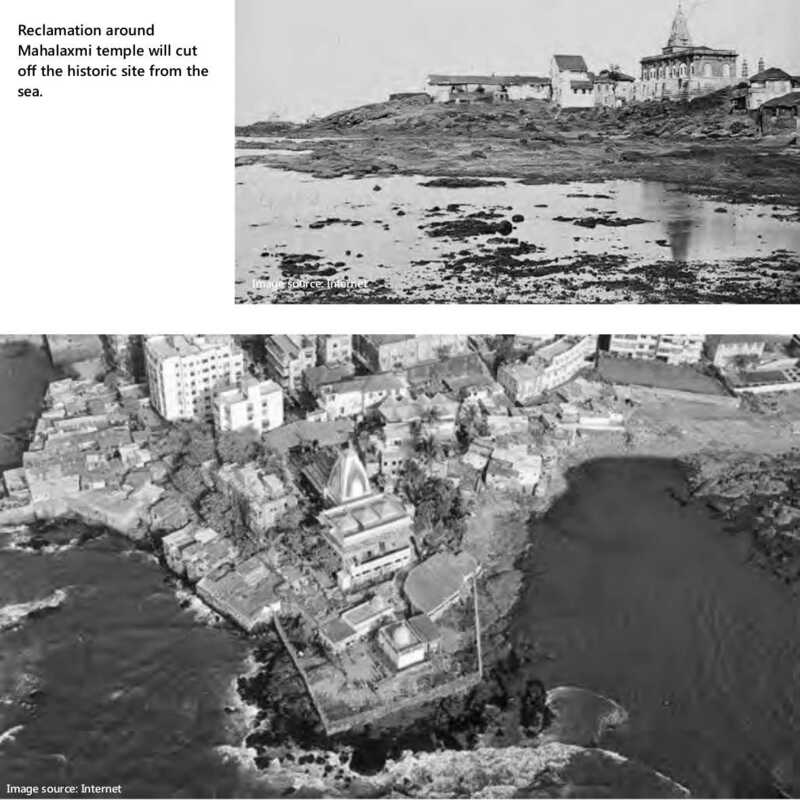 This kind of reclamation as is seen near Khar Danda koliwada should not be permitted. 14. 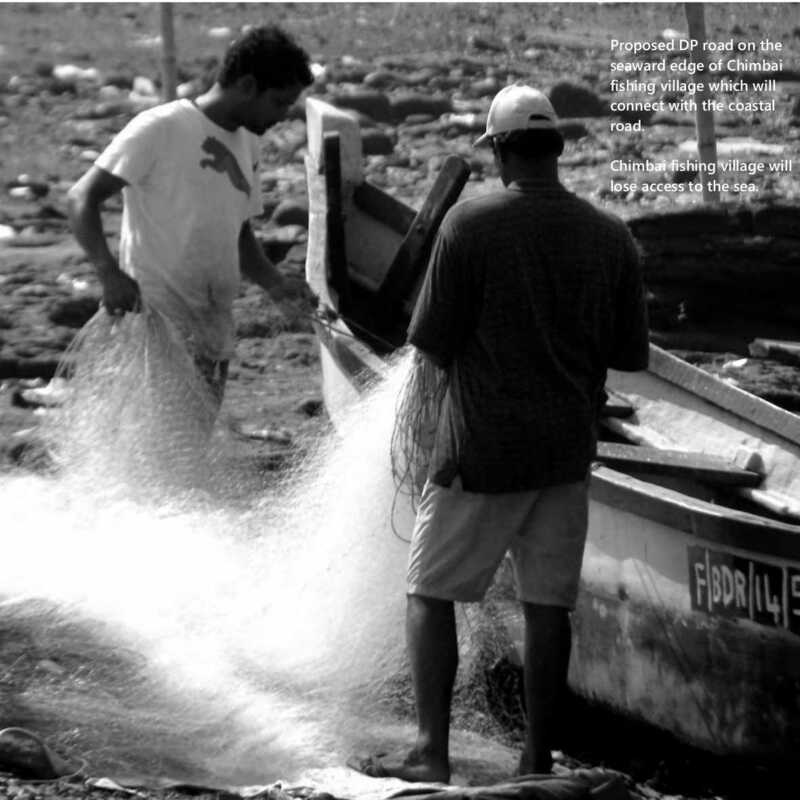 No new roads should be proposed on the seaward side of existing fishing settlements. 15. No stilt roads or freeways should be proposed over fish drying areas or areas designated for fish drying or primary activities. 16. 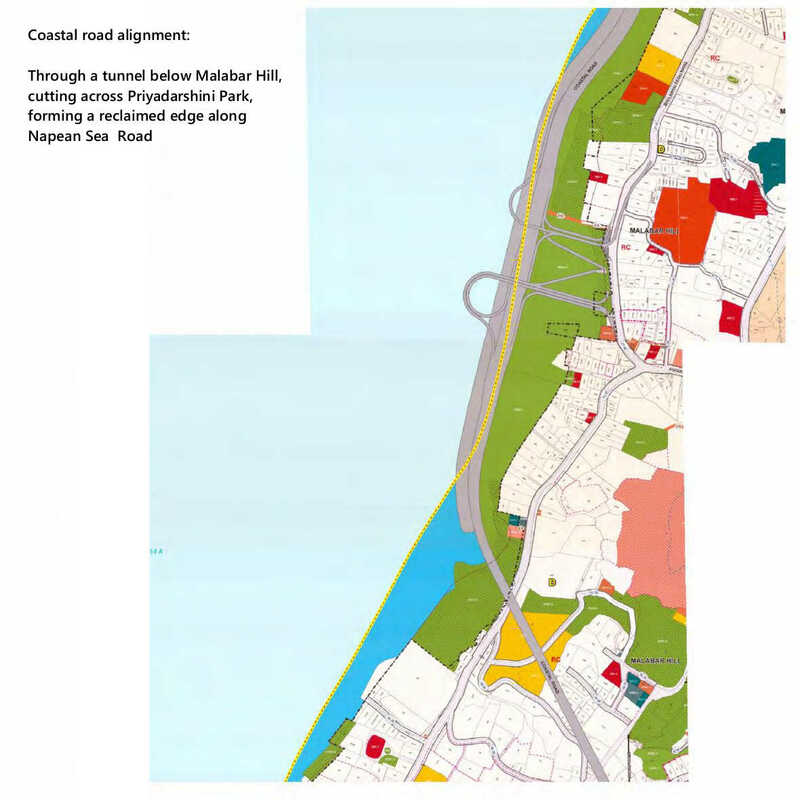 Areas in Greater Mumbai such as the Gorai, Manori region, backbay or the portlands have been designated as special planning areas and MCGM has not mapped existing landuses in these areas. 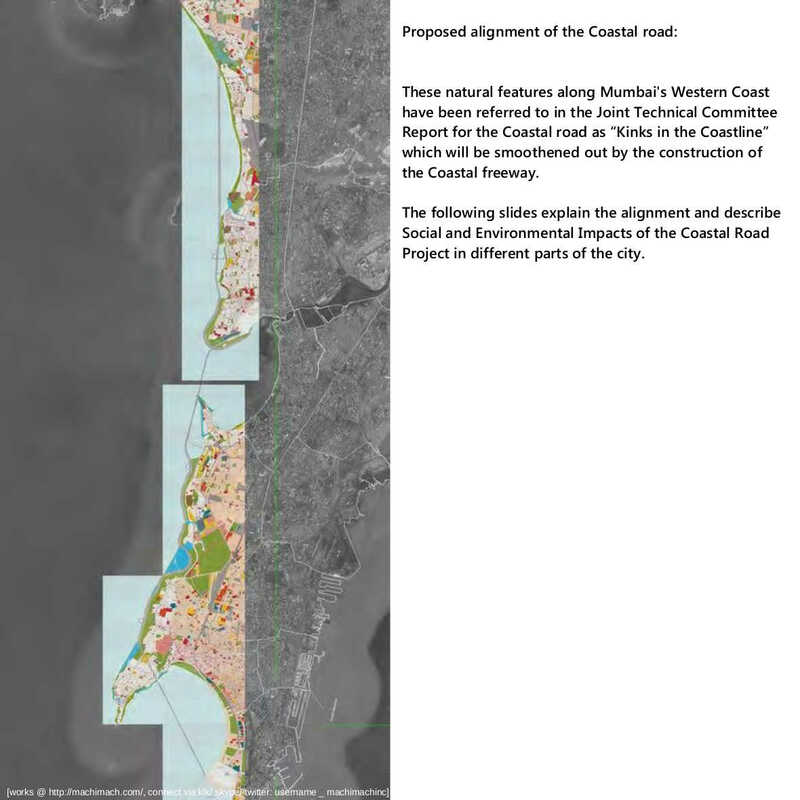 These areas which are a part of Greater Mumbai should be planned by the MCGM and existing natural features in these areas should be shown in the PLU map. 17. 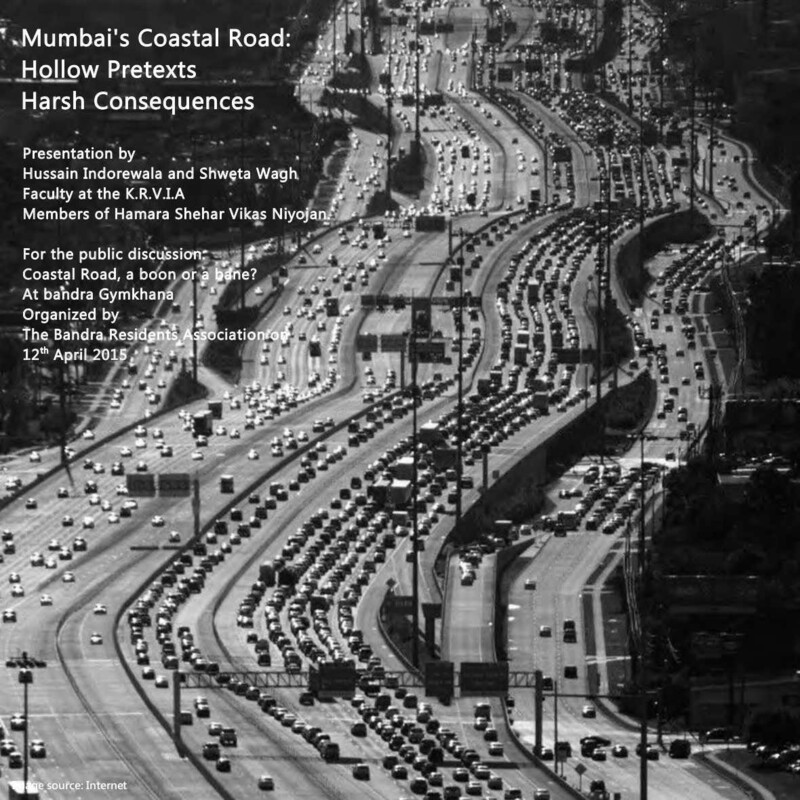 The Coastal road which connects Versova to the Madh-Marvey coastal belt will act as a trigger for speculative development and destruction of natural areas, such as hillocks, wetlands, plantations in this region. 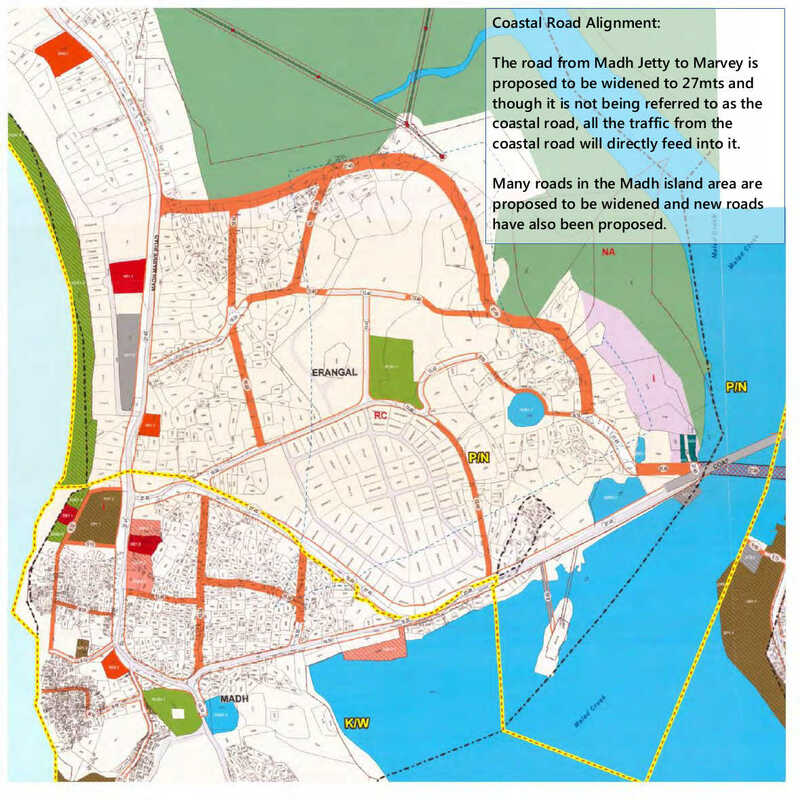 We object to this link as well as to the road widening of the Madh Marvey road to 27m. 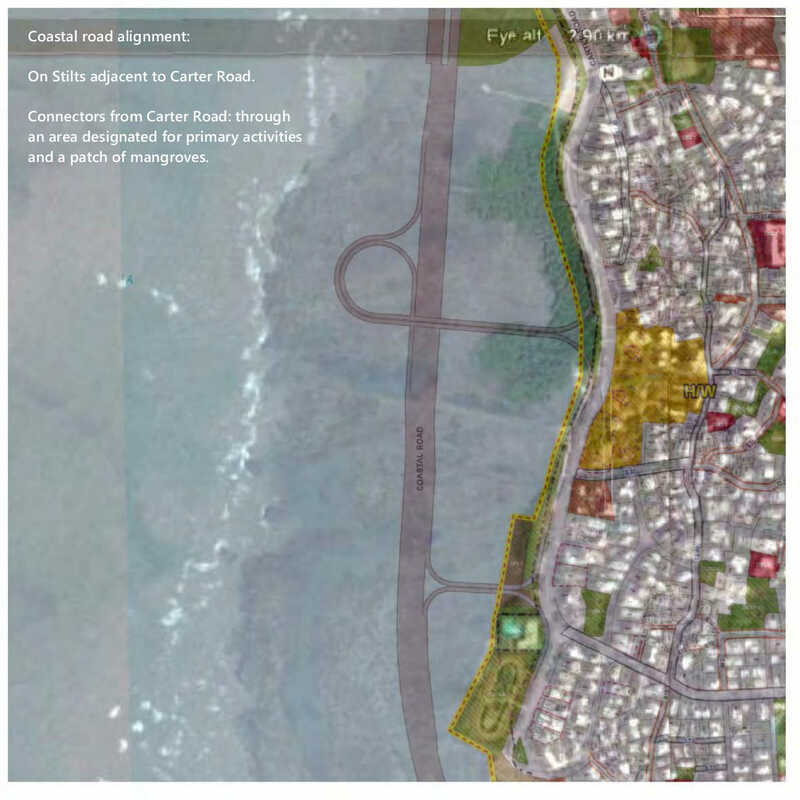 This will result in all the traffic from the coastal road being diverted to this area opening it up for real estate development and destroying the local ecology in this region. 18. 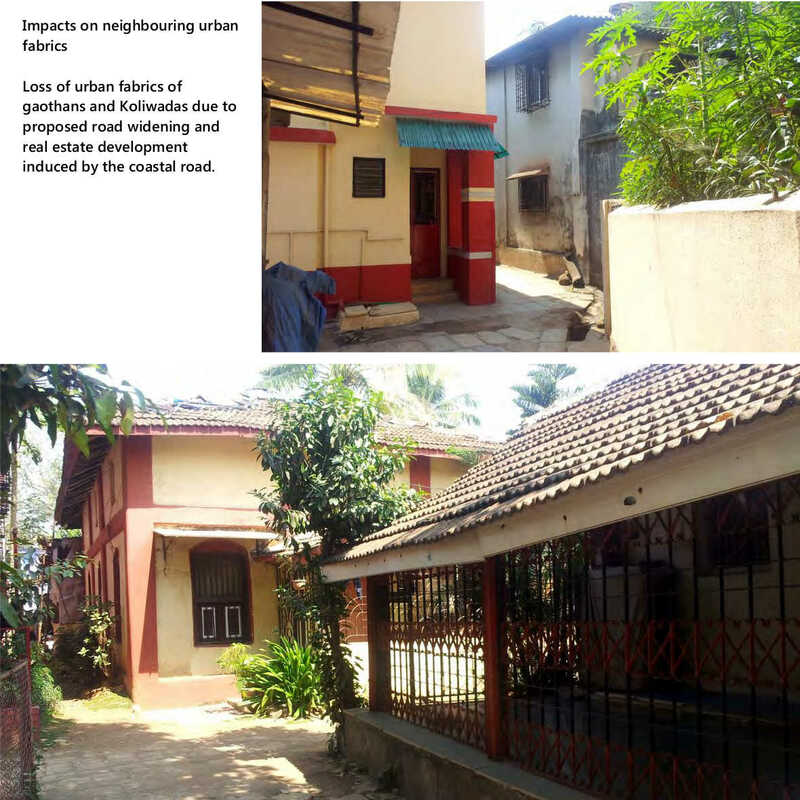 No development zones in the Mud-Marve area have been opened up for development and have been zoned as Residential-Commercial zone. 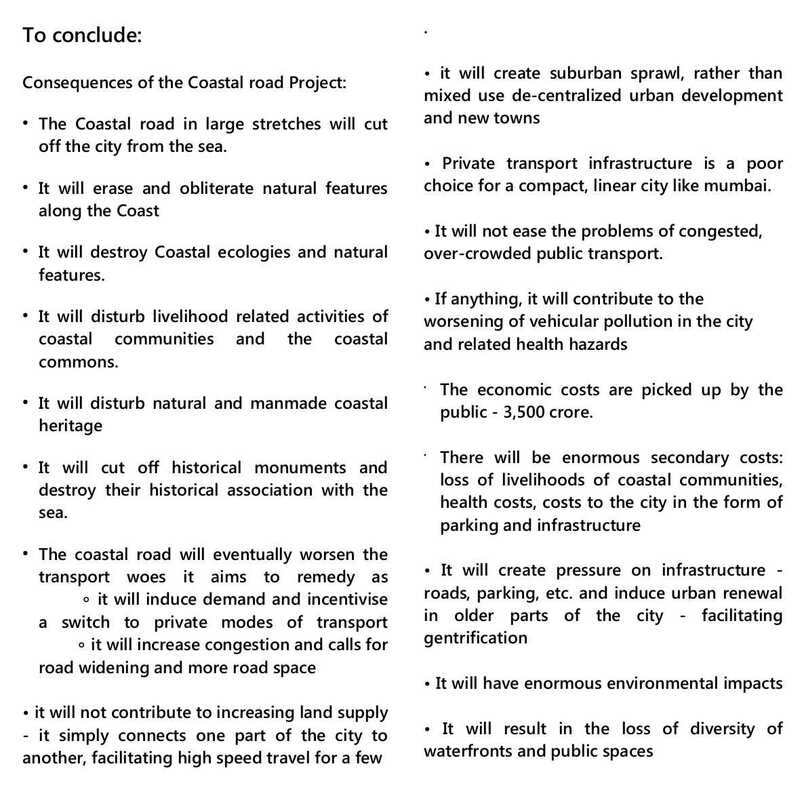 These include natural areas such as hillocks, plantations, salt pans, farmlands and coastal commons. The F.S.I in these areas has been increased to 2 which will destroy the fragile ecology of this area. 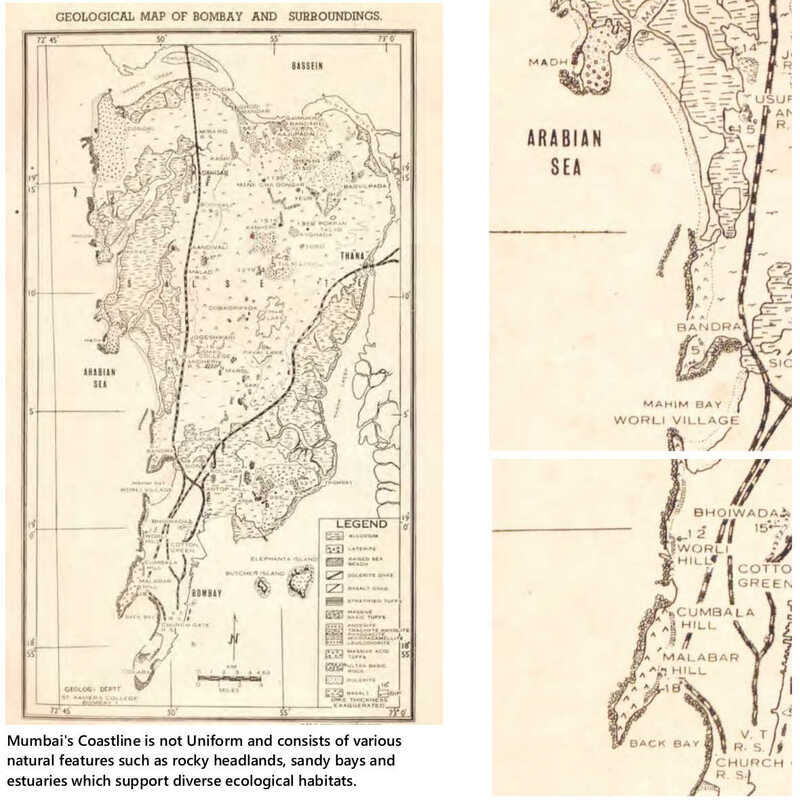 These natural areas should be demarcated and protected in the proposed land use maps. 19. 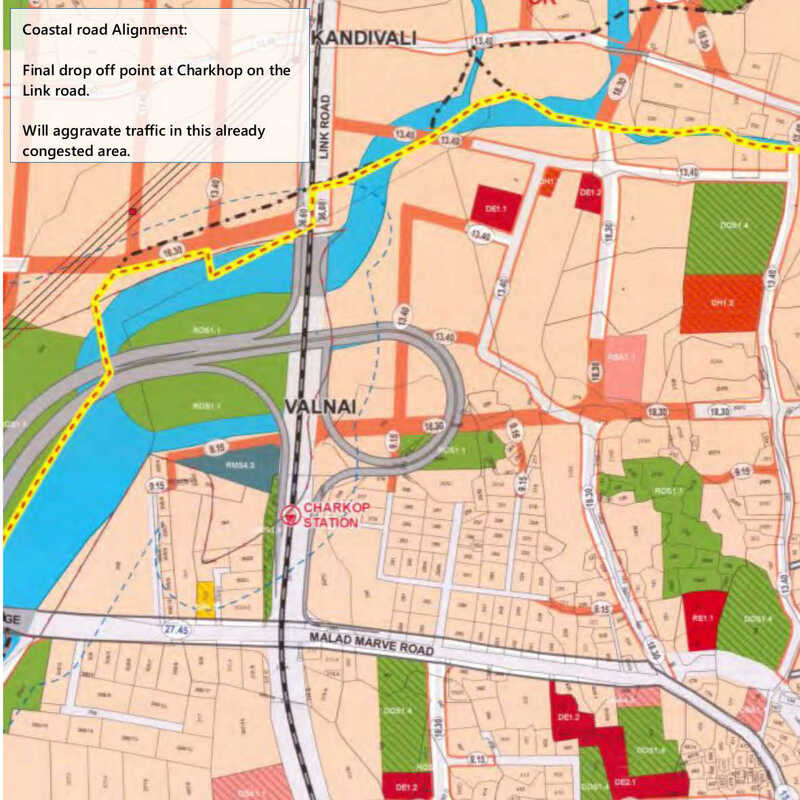 The Indiscriminate proposed widening of roads or the construction of new roads and freeways shown in the proposed land use plan will lead to bottlenecks and increase in congestion in neighbouring areas and should be avoided. 20. Instead of large freeways for private transport using public expenditure this there is a need to invest in upgradation of existing Public transport, especially Bus Rapid Transport and the suburban train network. The investments being made on new roads are disproportionate and will benefit only a few. The MCGM should instead invest in increasing the frequency and improving the quality of suburban train services. 21. The M.C.G.M. needs to plan and invest in better public transportation networks with emphasis on promotion of comfortable Public transport and higher investment in this sector. Further, the Singapore model for private road transport needs to be followed by restricting registration of private vehicles and adopting cordon pricing. 22. 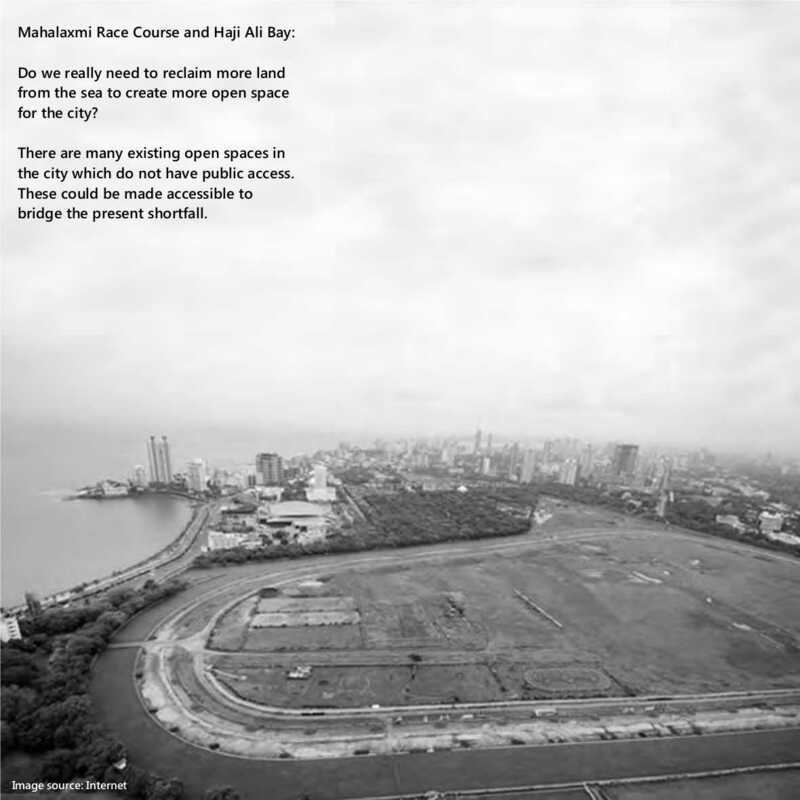 Instead of demarcating NDZ’s as open spaces or reclaiming new roads for open spaces MCGM should propose measures to improve access and quality of existing open spaces. 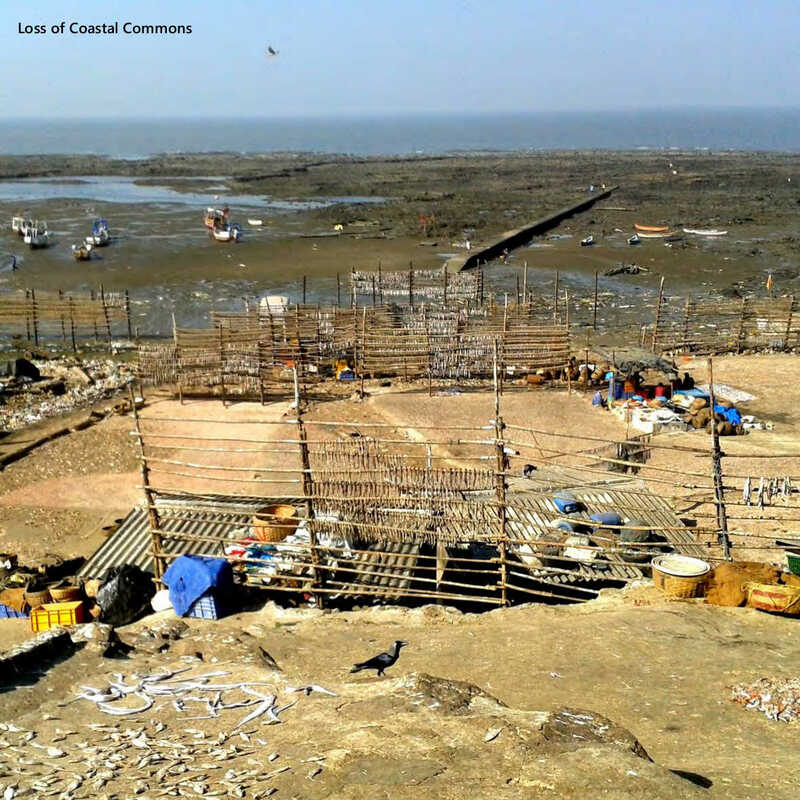 There is no need to reclaim new land from the sea to create more open space. There are many existing open spaces in the city which do not have public access. These could be made more inclusive and accessible to all sections of the population and all income groups bridge the present shortfall. 24. 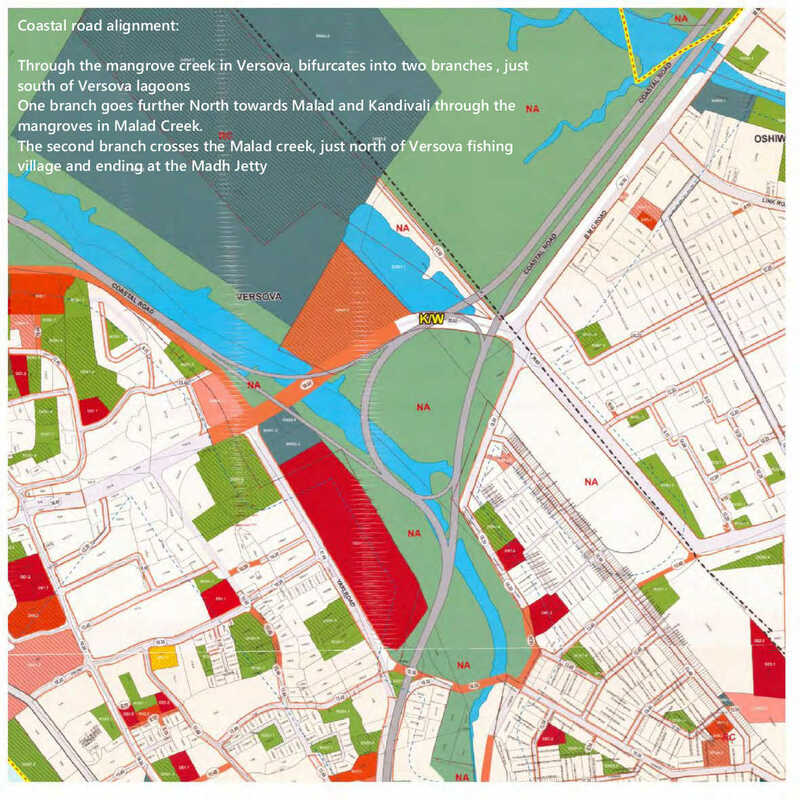 Heritage Sites and Heritage Precincts which include open spaces and natural heritage sites should be be marked on the DP maps. 25. There should be special DCR’s to protect and preserve existing tree cover and trees within both private and public properties. A treec count and mapping of existing trees should be undertaken by the relevant authorities to make it possible to enforce this. 26. There should be special guidelines or DCR’s specifying not only the number but also the type of trees and percentage of tree cover in new developments, open spaces and along roads. Guidelines for urban greening should be formulated and there should be an emphasis on promoting indigenous trees that will benefit the environment, improve urban biodiversity and serve as habitats. 27. Water harvesting systems should be made compulsory in every building: commercial, residential or institutional and public spaces to reduce runoff and the load on clogged and overloaded storm water drains. 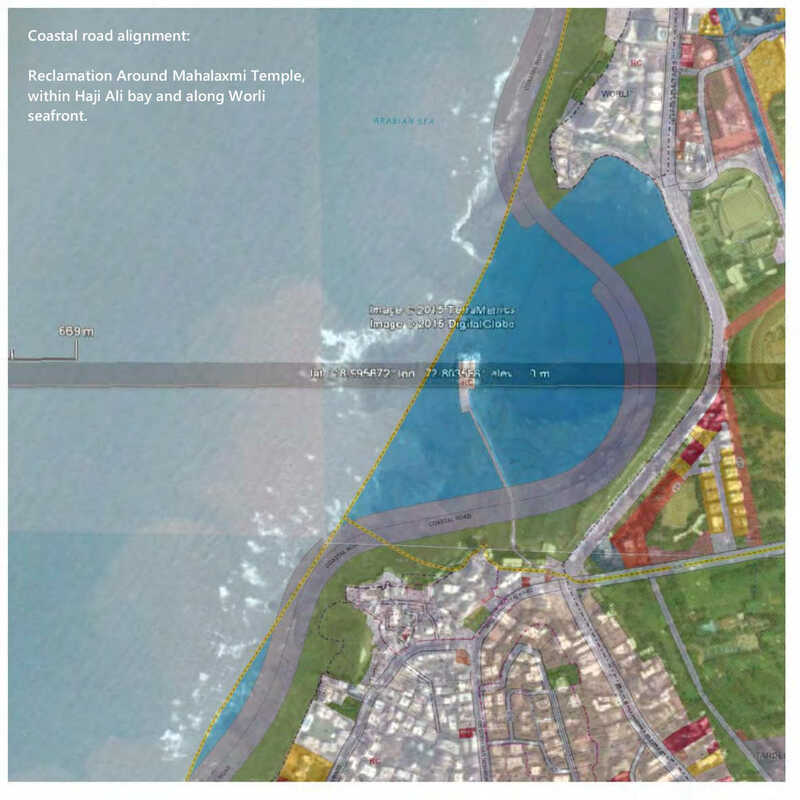 If implemented, this will reduce problems such as flooding. Guidelines and DCR’ s for water harvesting at every building level and plot level need to be formulated which will include reducing the percentage of hard paved area within plots and incorporating interventions to enable ground water recharge and reuse of ground water within plots. 28. Provision should be made in the D.P for decentralized filtration systems or reed beds to purify waste water and storm water in nallahs. 29. The D.P should also incorporate DCR’s for grey water recycling and reuse for gardening and other purposes especially for commercial and institutional buildings. 30. 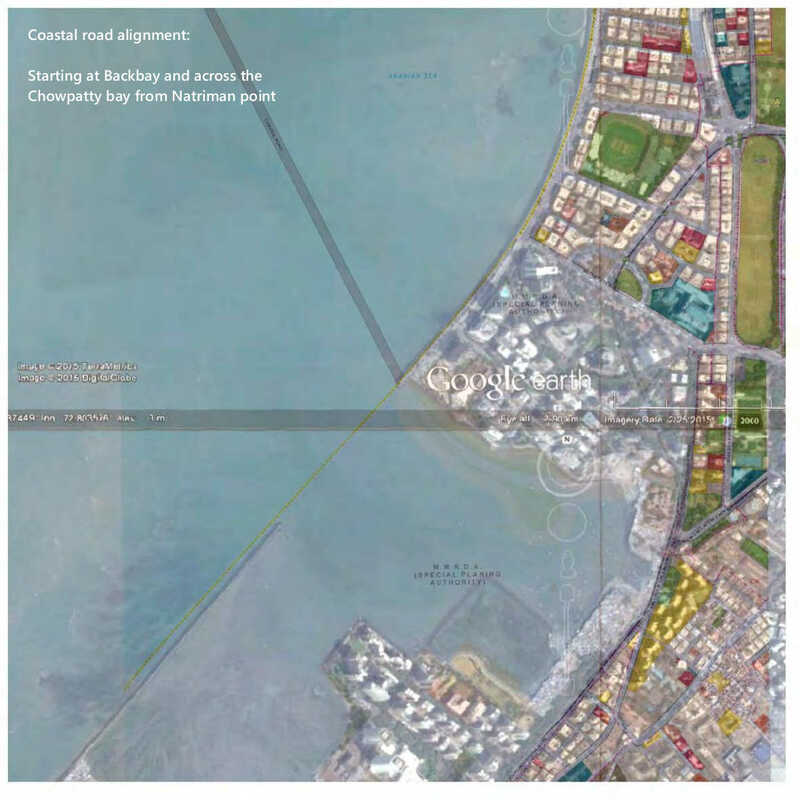 The Development Plan 2034 has considered only risk of flooding under Climate Change risks. Impacts of climate change should include all the factors like Sea level rise, Rainfall, increase in Temperature, extreme climatic events, earthquakes, etc. 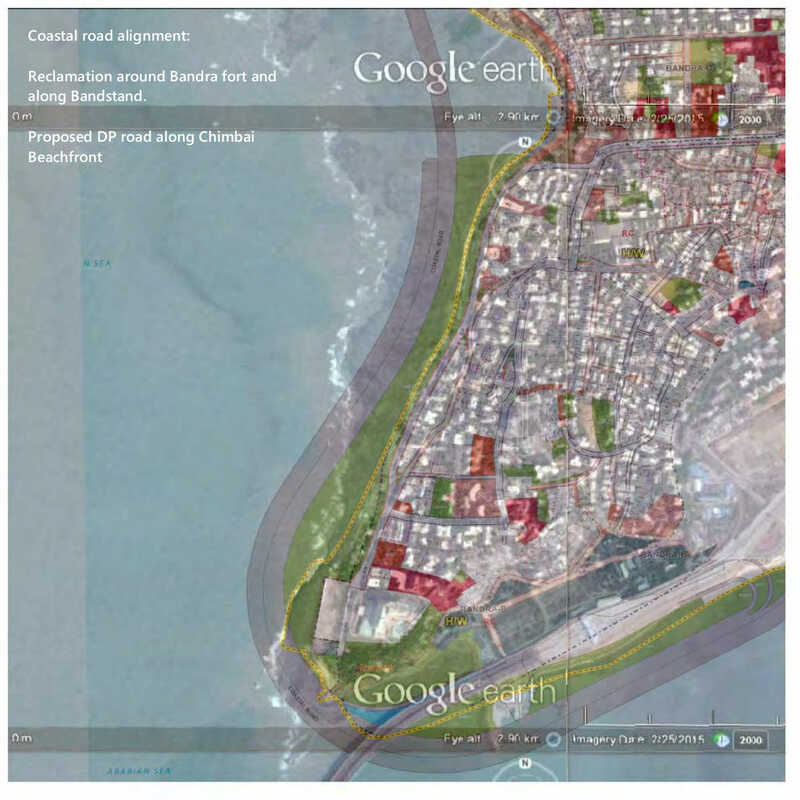 All new proposed projects must factor impacts of climate change in their study. 31. 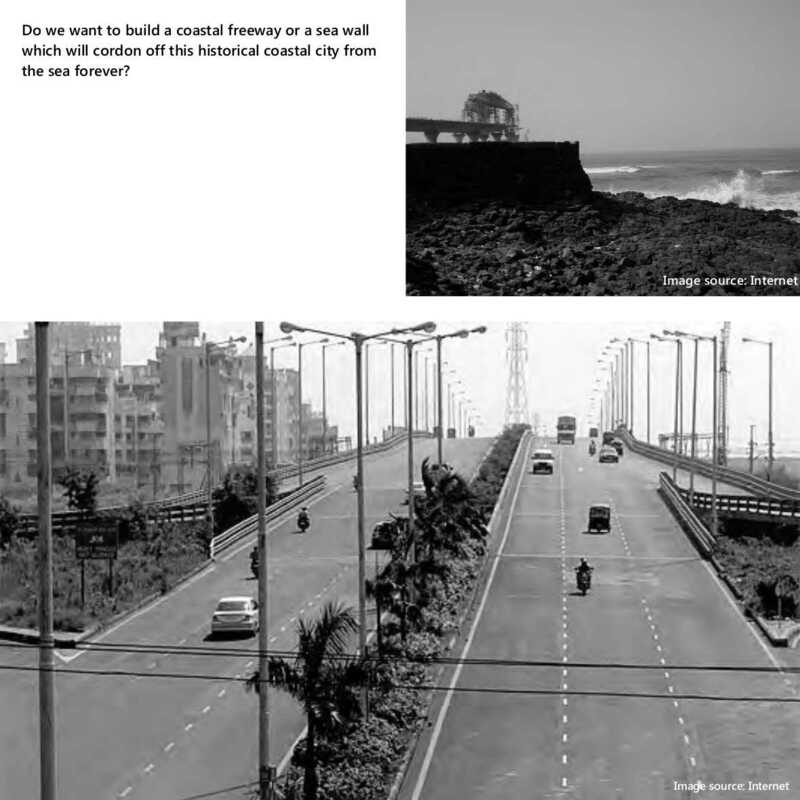 Risk assessment for city: We suggest MCGM undertake Risk assessments and Pollution assessment for the entire city before sanctioning new projects. 32. 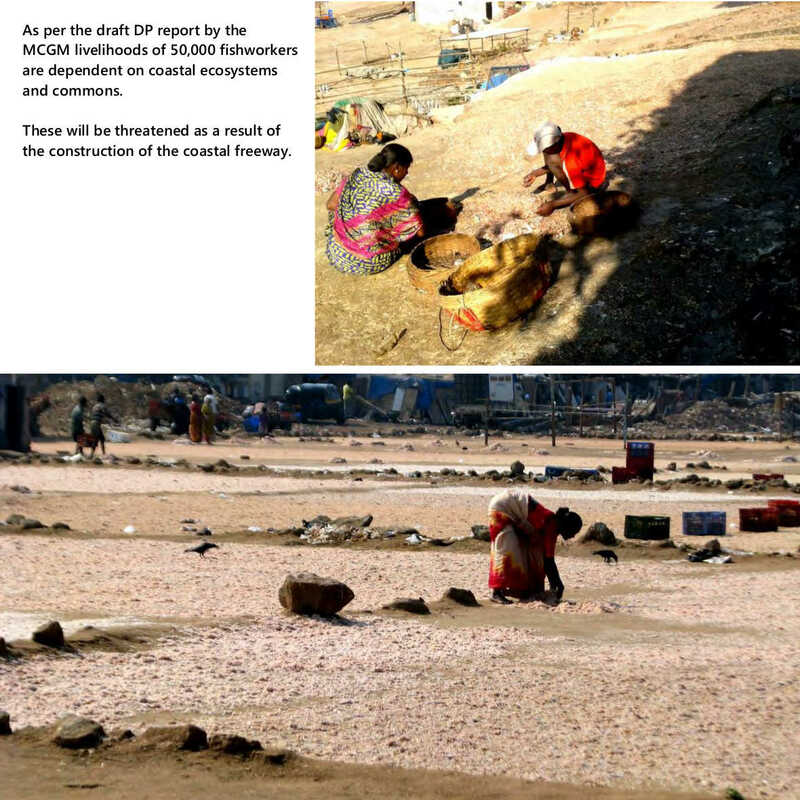 Garbage disposal management: Currently, Greater Mumbai’s environmental health is severely compromised due to increasing air pollution largely caused by vehicular pollution; increasing water pollution due to inadequate sewerage system and industrial pollution along with non-segregated garbage and plastic waste clogging drainage systems. Inadequate and poorly managed landfill sites are yet another cause of environmental pollution. The MCGM must discontinue the dumping of garbage on mangroves and mudflats and ensure that garbage is separated at source. 33. Mandatory water recycling and reuse: We depend on monsoon for water supply. There is no policy for recycling and reuse. Water recycling and reuse should be made mandatory for existing and new buildings. 35. We suggest that the HTL, LTL, 200 metre line, 500 metre line and the Hazard Line be marked on the DP maps. 36. We suggest that the silent zones be marked on the DP maps. 37. In view of the alarmingly high air pollution levels that our city has been witnessing lately, it is imperative to ensure that the new constructions do not adversely affect the air movements within the city. This parameter should be considered whilst approving new constructions. 38. It will be important to study these models and try to incorporate them in our effort to plan decentralized waste management systems at locality and ward level to reduce the load on landfills and the environment. We recommend that reservations for decentralized composting areas, urban agriculture and farms be incorporated in the D.P. 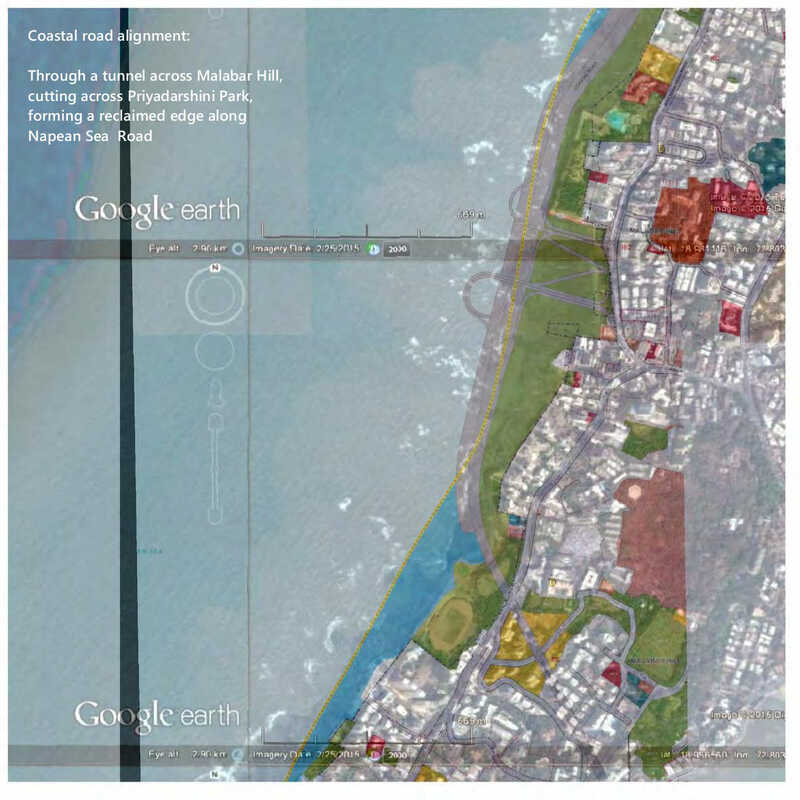 In existing open spaces in the city, an area can be designated specifically for this purpose. Urban farms and agricultural landscapes in the city have a productive, environmental as well as recreational value as opposed to resource intensive ornamental landscapes that are commonly seen in public gardens which usually have no other value apart from being aesthetic.